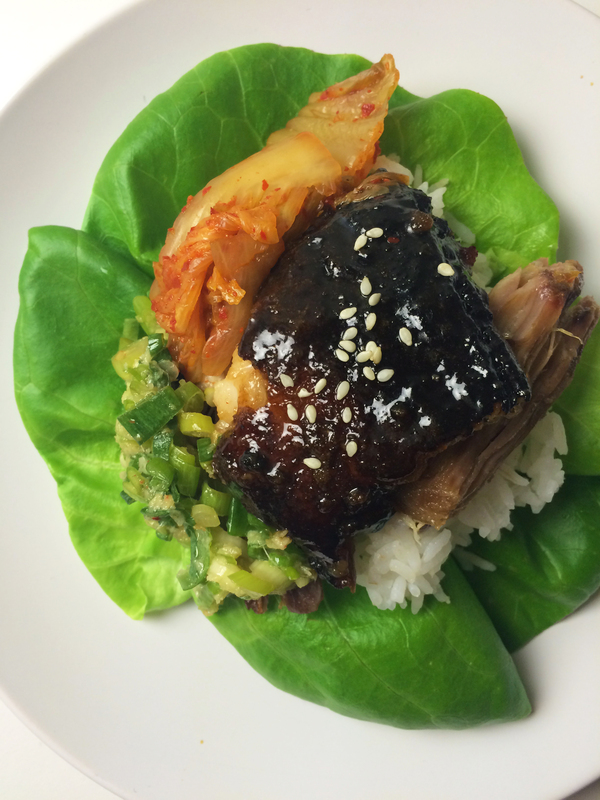 David Chang’s version of bo ssäm is easily one of my favorite meals in the world. 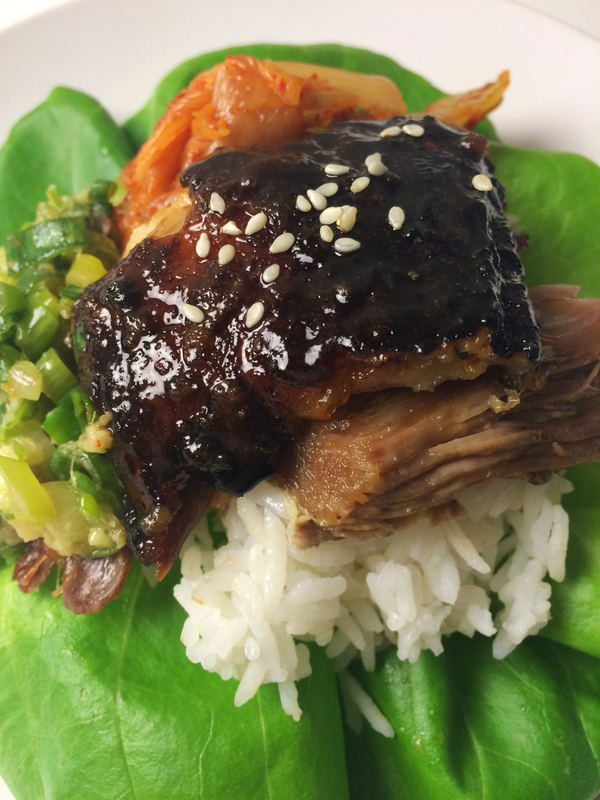 His somewhat American BBQ style spin to the traditional Korean dish creates an immensely satisfying and memorable meal with such a minute amount of prep it’s ridiculous not to make this the next time you are having friends or family over for dinner. Marcus and I first experienced the wonders of this dish 3 years prior when I made 20 lbs of pork shoulder (twice this recipe) for a Christmas Day feast. It has lived in our hearts and minds, as well as the hearts and minds of those who partook in its fabulousness since that time. Roasting Hour 4 of 6. Maybe it’s the cold; maybe it’s cabin fever; maybe I’m just really bored these days and need a new hobby–who knows–but I couldn’t get the thought of this succulent, crispy, gooey, salty and sweet loveliness out of my head. 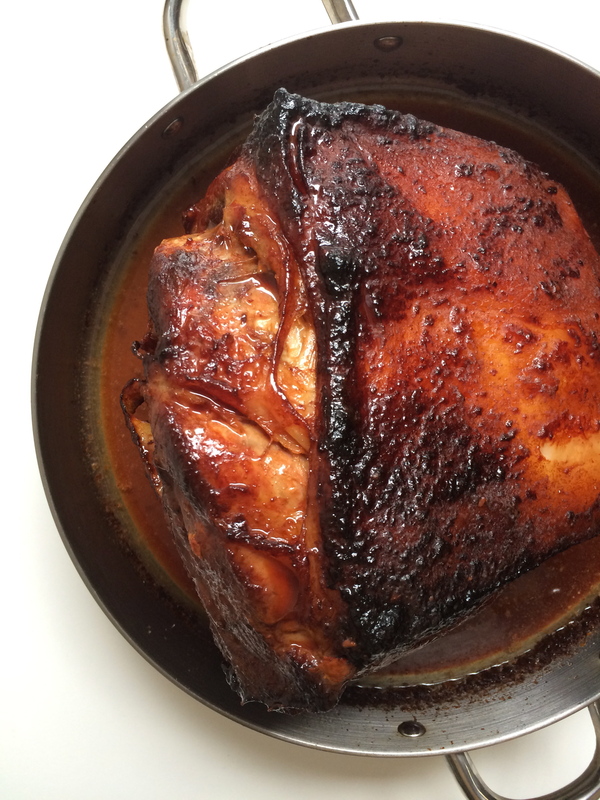 For weeks I had been talking about bo ssäm–I just needed an excuse to purchase and make 10 lbs of roast pork. When a back-to-back dinner for four on Thursday and for five on Friday presented itself, I jumped at the opportunity. 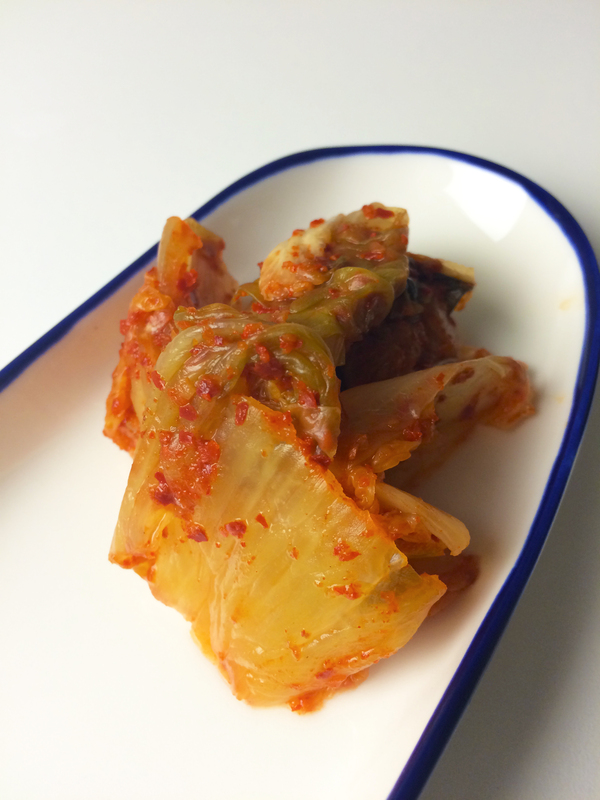 I love kimchi. I love it so much. CURE THE MEAT: Mix the white sugar and salt in a medium sized bowl and set aside. Place the pork in a large, bowl, pot or dish that can fit into your fridge. (I used my crock pot base.) Rub the sugar and salt mixture all over the meat. Cover the dish with plastic wrap and place in the refrigerator for at least 6 hours or overnight. ROAST THE MEAT: Position your oven racks on the bottom and penultimate positions. Heat the oven to 300°F. (Use an oven thermometer to calibrate the temperature as most ovens present with issues when at lower temperatures. Mine had to be set at 320°F to retain a 300°F temperature.) Get out a roasting pan. With your hands, remove the pork from the curing dish, and place in the roasting pan fat side facing up. Discard the remaining cure and any juices that were in the curing dish. Set the pork in the oven, add ½ cup of water to the base of the pan, and cook for approximately 6 hours, or until the pork easily comes off the bone when poked with a fork. After the first hour of cooking, baste the pork every 30 minutes with the pan juices. (Instead of basting with the oven door open, I remove the pan from the oven, close the door, and baste on top of the stove so my oven temperature doesn’t drop.) When the pork has finished cooking, you can remove it from the oven and allow it to rest for up to an hour. MAKE THE SAUCES: This can be done the night before when you are curing the meat. 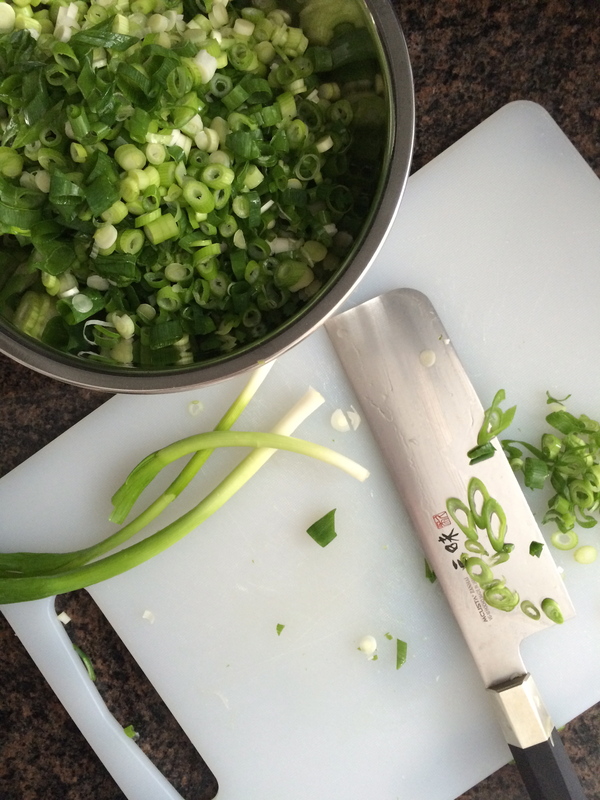 For each sauce, use a medium sized bowl and combine their corresponding ingredients. Mix well. MAKE YOUR RICE: Interestingly enough, I cannot make rice. Yep, I can make almost anything else in the world, but do not possess enough patience to cook rice in a pot. It’s okay. I readily welcome my shortcomings and use an Aroma Rice Steamer to make perfect rice for me. I usually start a little after roasting hour #5. THE FINAL LAP: Turn your oven up to 500°F. While it is heating up, get your table ready to feast. 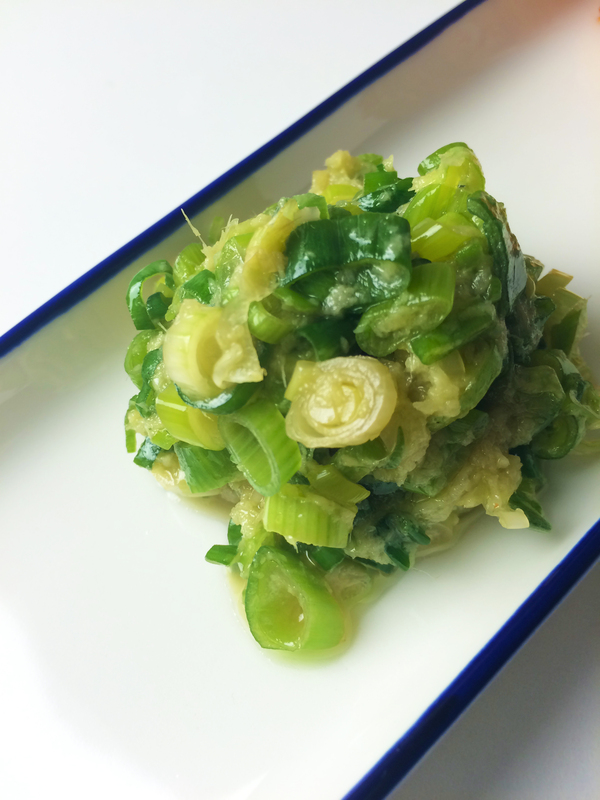 Put your sauces and kimchi in bowls and the lettuce leaves on a dish. Get out a few bowls for rice and a heating pad for the meat if you are thinking about serving it in its roasting pan. Mix the brown sugar and 1 tsp of sea salt in a small bowl. Using your hands, rub this mixture all over the roasted meat. Place the pork back in the oven for approximately 10 to 15 minutes, or until a dark caramel crust has developed on the meat. (It may look gross during this step and when you first pull it from the oven. I assure you, it is still very, very tasty and you have cooked it correctly. It will get better looking as it cools). 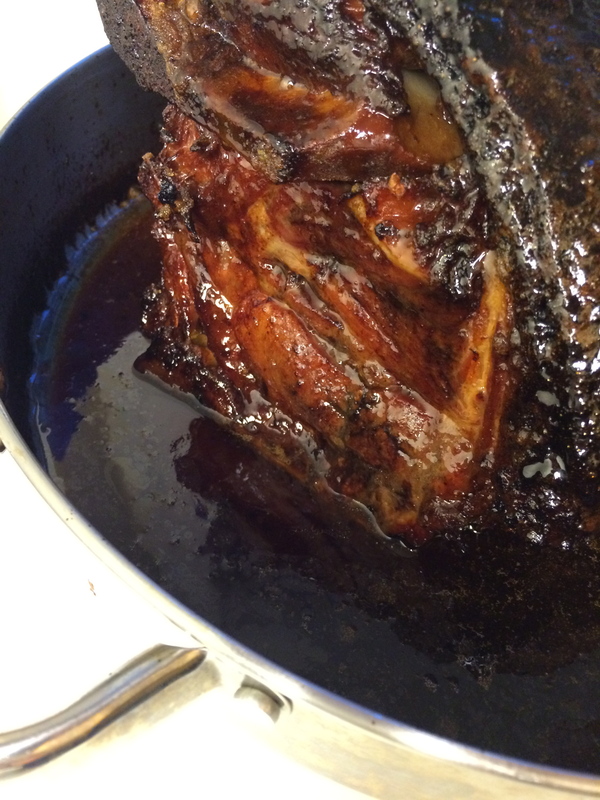 Caramelized Goodness – Yes, the crust that developes is supposed to look that dark. Call everyone to the table. Let each person assemble their own bo ssam according to their palette. I usually do (in stacking order from bottom to top): lettuce, rice, pork, pork drippings/sauce, ginger scallion sauce, ssäm-like sauce, kimchi. If there happen to be leftovers, cover pork with aluminum foil and reheat in a 300°F oven for 30 min to 1 hr.